Ammolite is said to be one of the rarest gemstones in the world and it is highly prized for its vivid, flashing, rainbow colours. You will be hard pressed to find a gem that is as beautifully unique in its brilliance, colour and pattern formation. The name of this organic gemstone originates from ammonites - an extinct group of ancient marine invertebrate animals that dominated the seas 70 million years ago. Through countless years of tectonic pressure, this exquisite stone formed from the fossilised remains of the ammonite shell in a type of rock formation known as Bearpaw Shale. As with a fingerprint, ammolites are highly unique since no two stones are alike. The natural inclusions in these gems are part of their exceptional character - each one is individual in colour, brilliance and pattern. Exquisite ammolite gemstones distinguish themselves for being extremely rare, highly unique and stunningly beautiful. Their scarcity and magnificent brilliance makes them a treasure that will certainly turn heads when worn as jewellery. 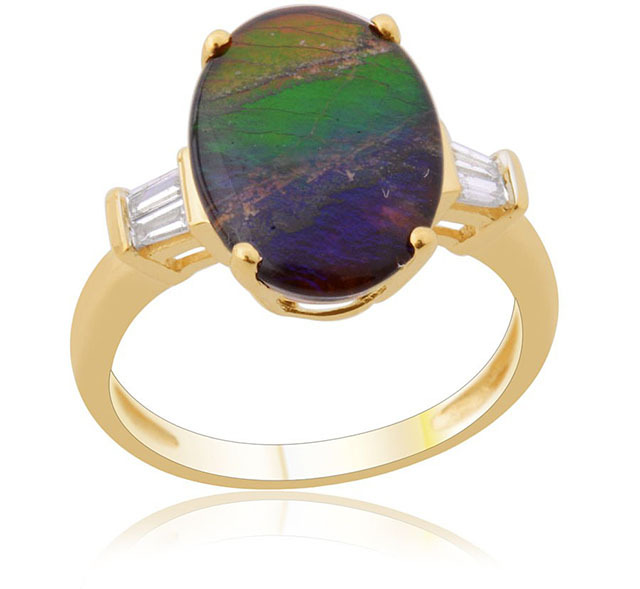 If you want an ammolite set in a ring, the best choice will be one that is covered with a durable synthetic stone such as corundum or spinel. Since ammolite gems are so scarce, they can be very expensive, even for the more mediocre stones. Loose ammolite gems are sold for between approximately £13 and £32 per carat. However for high quality or very large ones, hundreds of pounds per carat would not be surprising.